Compared to my previous BMW RT1200, the Trophy is easier to remove the fairings. BMW owners of the newer bikes complain of tabs breaking off the fairing on removal. Yeah, but on the R1200RT, the heads are out in the wind so you don't even need to remove any plastic to get to the valve covers, do you? And I agree, I'd rather have bolts for the fairings than the puzzle of tabs and slots I have on my metric bike, which doesn't even have that much plastic, but almost needs a degree in engineering to figure out how to get the side cowls and lower cowl back together. And taking it apart, I always feel like I'm going to break it. For me, it was simple - Hands-down, Trophy wins every time. In looks, in comfort (I found the FJR to be very uncomfortable with the stock seat) in range, etc. The only areas where the FJR kinda matches up is in suspension and it does perform very well. But I feel like others in thatI feel the FJR is far more sport than tour. I like the feature set of the FJR as well, and I think it matches up favorably with the Trophy. But there was just too much on the Trophy's side for me, and that is why I bought the Trophy. I totaled my 2013 TTSE in May and I replaced it with a 2014 FJR. It fit my budget. While the FJR is a nice bike, it doesn't hold a candle to my old TTSE. In virtually every respect the TTSE is better. Well, I found a deal on a new 2017 Triumph Trophy SE too good to pass it up and bought it last Columbus Day (Oct 8th, 2018). 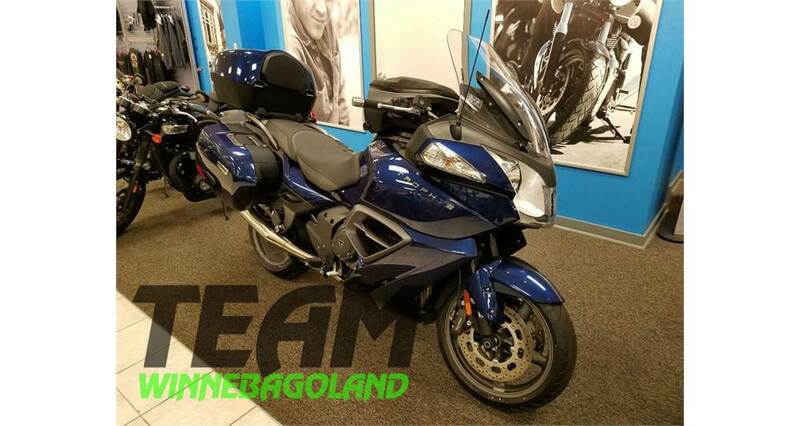 $15,000 with Top Box (matching top, backrest pad, slide tray, inner soft bag), Triumph Trophy Tank Bag, pannier inner soft bags, heated passenger and rider seats, heated grips. To me, it feels comparably nimble to the FJR...so, glad I drove 860 miles (both ways: a Pickup truck with trailer, and a puppy) to get mine! But, besides my truck, the only engine I'm running these days is my Troy-Bilt snow blower (with heated grips). May 1st begins the Motorcycle registration year here - long winter ahead! Congratulations and it's a Blue one! You're a lucky fellow! I am more intrigued by my TTSE daily. It's everything I wanted in mt 75' Trident and a bit more, Ha! Haven't gottem back to Florida to ride the FJR 1300 this year so I'll keep enjoying the TTSE when the snow and rain isn't falling here. Good luck! and the best color too! Congratulations!